Marco Bovi, Stefano Caleffi and Maria Eleonora Sassi completed a crossing the Bocche di Bonifacio (Strait of Bonifacio) that separates the Tyrrhenian Sea from the western Mediterranean Sea. The strait is notorious among sailors for its weather, currents, shoals, and other obstacles. 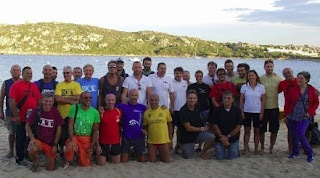 The 15 km course, organized by NAL (Nuoto acque libere), was typical; starting in the darkness in the early morning hours, the course from Sardinia (Sardegna) to Corsica was rough and turbulent. Bovi finished in 4 hours 16 minutes while Caleffi and Sassi finished in 4 hours 40 minutes and are shown above with the event's kayakers and volunteers.